The enemy are information control fascists. 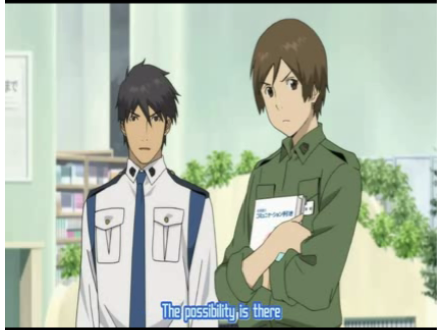 Library War (Toshokan Sensou) is an enjoyable 2008 anime about information warriors. In a time when information is tightly controlled by military forces, those who treasure and preserve information have formed a military counter-balance, the Library Defense Force, to protect information oases. This anime follows a LDF member Iku Kasuhara (voiced by Marina Inoue, Kyoko, from Skip Beat), as she moves from recruit undergoing harsh training, to her time in service on the Elite Task Force for the Kantou Library. The show is a mixture of military life, romance,and the theme of Freedom of Expression. Iku Kasuhara, our earnest heroine. The artwork for Library wars is very good, as can be expected from the team at Production I.G. (makers of GitS:SAC, Ghost Hound, and Guardian of the Spirit, to name a few). As can be seen in the screen grab of Kasuhara above, the artists occasionally use a heavy line effect which is quite striking. As stated above, the central tension of the show is the opposition of the LDF and the government censors, known as the Media Betterment Committee. The premise of the show was inspired by Japan Library Association’s Statement on Intellectual Freedom in Libraries. 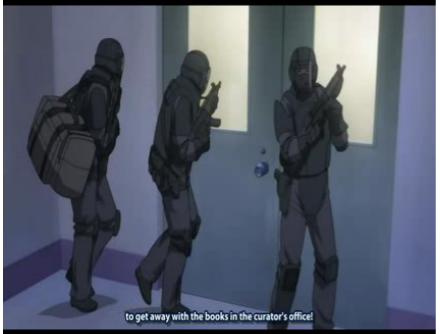 Although it may not be unique, Library War is certainly unusual in adopting the principle of Freedom of Expression as the show’s driving theme. Government censors attempt to confiscate books. Amongst the fine seiyu working on this show, we get a great performance by Miyuki Sawashiro (Shinku, Rozen Maiden, and Celty, Durarara!!) as Kasuhara’s roomate and Intelligence specialist, Shibasaki. 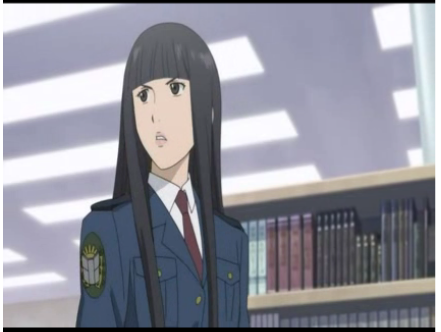 Asako Shibasaki, Librarian and Military Intelligence. In addition to military operations to oppose the MBC, Kasuhara’s life at the Kantou library base includes time spent with friends and colleagues, and naturally, there’s time for romance. 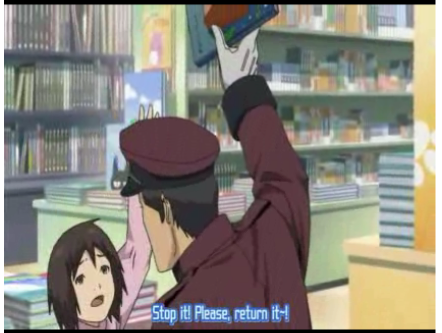 Library War, unlike so many anime, consists of characters who are no longer in school. Many of the characters are in their 20s, and some are much older. 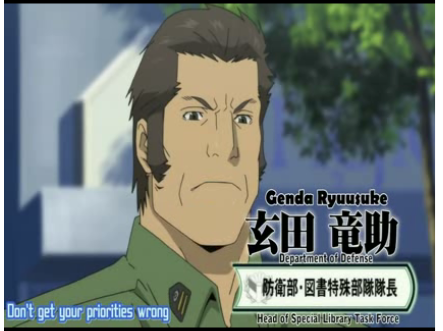 The show introduces characters with a very nice graphic, that shows their name, rank, age, weight, and a significant characteristic. Characters are introduced with a smart-looking graphic. Library War is an excellent, short series, especially for those looking for a show that examines the lives of working professionals, with occasional action, comedy, and romance. Further the theme of resistance to threats to the Freedom of Expression is noble and uncommon. I highly recommend this series. Unfortunately, there are currently no announced plans for an R1 release, but Viz is expected to release a manga adaptation (based on the original light novels) in June 2010, toward which I am very much looking forward. When the freedom of libraries is imperiled, we librarians will work together and devote ourselves to secure the freedom. @ojisan: I think that’s what got me interested to begin with. cognitive dissonance. 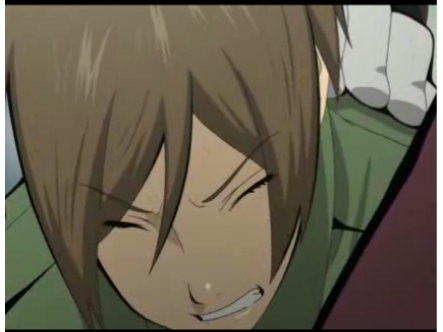 I think it was 2008 (Spring) ^_^ Nice review, I wish Production I.G. did more relation stories like this. Eden was good, had something there, but was not as doki-doki fresh as this. 🙂 Also, Sawashiro is love. Yeah, P.I.G. (heh, heh) does some great stuff. Library War really impresses on several levels. I did like Eden of the East, but it wasn’t something that could be taken too seriously. Library War handled things in a much more down-to-Earth way, despite the fantastical set-up. To me, it had a more authentic feel, like it was someone’s lives, whereas Eden always seemed like a fun show I was watching.